"You feel at home in Cazenovia!" Students enjoy all that the local Cazenovia community offers to their experience at Cazenovia College. The college is nestled in the Village of Cazenovia where you’ll find the security of small-town living combined with many social, cultural and recreational activities. Nearby Cazenovia Lake is an integral part of both the academic and recreational student experience at Cazenovia. 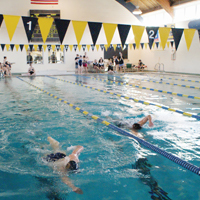 Whether you are looking for local arts and entertainment, a local pool to take the kids for a swim, fitness and wellness classes, or continuing your education through a class or lecture, Cazenovia College places these opportunities right in your backyard. We encourage the local community to take advantage of events and facilities throughout the campus.